Ghana’s Sports Minister designate Isaac Asiamah has given under-fire FA boss Kwesi Nyantakyi a massive vote of confidence amid claims of public anger against the FIFA council member. Asiamah touted the achievements of the FA chief when he appeared before the Appointment Committee of Parliament on Tuesday on his vetting for the top position. Nyantakayi has come under mounting pressure to quit following the Black Stars disappointing fourth-placed finish at the recently concluded Africa Cup of Nations. Critics are hanging him for the Black Stars failure to win the elusive African title since he assumed the reigns of the presidency 12 years ago. They claim he’s presided over massive rot at the federation and want him out by any means. But in what appears a subtle vote of confidence, the incoming sports minister lauded the achievement of the Wa All Stars owner when he appeared before Ghana’s Appointment Committee. “We qualified for the world Cup on three occasions under him and even though I admit there there is a lot we can do to improve sports I think the best way to go is to dialogue. The future of the FA boss has split heads in the West African nation amid claims and counter claims of his lack of competence. Ghana League Clubs Association chief Kudjoe Fianoo has launched a campaign to oust the FA president from his seat over claims of running the game down. Criticism has intensified since the Nations Cup semi-final failure against eventual winners Cameroon. 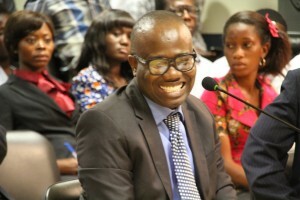 But it appears Nyantakyi will enjoy support from the incoming sports minister after publicly hailing the work ethics of the FIFA council member.